On Reality Asserts Itself (RAI) with Paul Jay, legendary musician Roger Waters and Sut Jhally discuss their new film about the Israeli public relations campaign to influence U.S. public opinion. JAY: Welcome to The Real News Network, and welcome to Reality Asserts Itself. I’m Paul Jay in Baltimore.Of all the official narrative that tries to explain the world in the interests those who control U.S. foreign policy, perhaps nothing is as powerful as the influence of how the media covers Israel/Palestine, a country which is cleared by the united nations and independent journalists and commissions that have investigated the situation. Israel clearly has an illegal occupation of Palestinian lands. It has committed war crimes in its attacks on Gaza and other places. Yet, the prevailing public opinion and certainly the prevailing media and political opinion is Israel’s the victim in all of this.There’s a new film that tries to explain why Americans think this way. 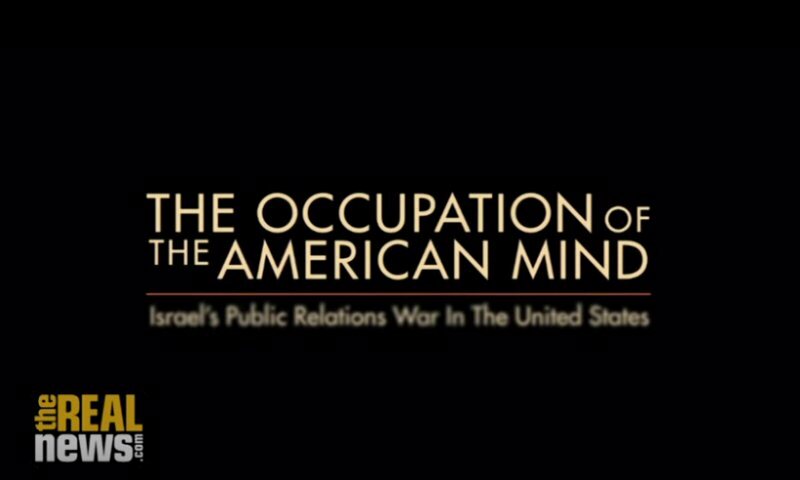 The film is called “The Occupation of the American Mind: Israel’s Public Relations War in the United States.”And now joining me is the executive producer of the film, and the narrator of the film. First of all, in the studio is Sut Jhally. He’s professor of communications at the University of Massachusetts, and founder and executive director of the media education foundation. Sut’s been involved in the production of more than 75 films, most recently, as I said executive produce of “The Occupation of the American Mind.”And joining us from…I believe…are you in New York Roger? Or LA? JAY: LA. Joining us from Los Angeles is Roger Waters. He’s the narrator of “The Occupation of the American Mind.” He’s an English musician, singer/songwriter, and composer. Best known as the bass, co-lead vocalist, lyricist, principle songwriter of the very famous band Pink Floyd. Over the last few years, he’s emerged as a prominent advocate for Palestinian human rights.Thank you very much for joining us Roger and Sut. JAY: Roger, let me start with a somewhat personal question to you, and then we’ll kind of get into the film more. One of you best known songs is “The Wall.” You made a film with the name. The wall which is the separation wall between Israel and Palestine, or the current occupied territories, has become a major symbol for you, in terms of the way you’ve written about the wall…a passion for you politically. Um, you’ve talked a bit in previous interviews about breaking down your own personal walls. This wall is a metaphor at many levels for you. When this sort of wall about…not just being political in terms of being, having opinions and thinking, but breaking down that wall where you decide you have to put your neck out. You have to be an activist. You have to actually get out and change the world in a very active way.Why is it the Israel/Palestine question that seems to be the one that galvanizes you? WATERS: Well, I’ve seen that wall. I saw that wall ten years ago. I went to Israel…they tacked a gig on at the end of a European tour, in Tel Aviv, and that was really the start of my involvement in all of this, because I accepted to do that show. And I was then approached by, among many others, by Omar Bagutti, and we had long conversations, and I started to learn a little bit about the situation. And, in fact, I cancelled my gig, on his, and many hundreds of other peoples recommendations.I did perform in Israel in 2006, but I moved the show to an agricultural community called Navashirum, or Asalam, I think is the Arab name for it. Which is about halfway between Tel Aviv and Jerusalem, and it’s an ecumenical community where Jews and Arabs and Muslims and Christians and [inaud.] all live together, grow chickpeas and their children all go to the same school. And so it’s a very cool example.So we did the gig there, and it was a huge success, but I realized that I was playing to an entirely segregated audience. There were only Jewish Israelis there. And also, at the end of show–they were extremely enthusiastic, I have to say, and very knowledgable about the work that I was doing–but at the end of the show, when I made a very short speech about how they were the generation of Israelis that needed to start communicating with their neighbors and make peace, they went very, very blank. This was not in the script. And theyre following a script.What Sut’s movie is about, it’s about the fact that the citizens of the United States of America are also following a script. And the scripts are remarkably similar, because they derive from the same Orwellian ministry of truth, which is campaign of Hasbara, or the explaining of the Israeli situation to the rest of the world. And so, that was one indication that I had in 2006, that things were kind of screwy.I went back in 2007 and under the protection of the United Nations, and I traveled around the West Bank extensively with a lovely women called Allegra Biceglia, who was working for [inaud.] at the time. JAY: This was when you made the film? WATERS: Yea, we made a little clip of spray painting slogans on the wall in…actually around the refugee camp in Bethlehem. But in traveling around the West Bank, at that time, I had meetings with some of the elders in refugee camp in [inaud. ], and up in the north. I drove all the way down there, and through the east as well, all the way down the Jordan river…came back through Jericho, and it’s chilling if when you actually see it with your own eyes, to see a [inaud.] in operation, in a country that is almost entirely supported by the United States of America, that makes claims about liberty, freedom, and equality, and so on.In fact it’s enshrined in the institution of this country, that all men are created equal, and so on and so forth. It’s chilling to see a system of military occupation being operated where there is no question of people being treated equally. There are one set of people…are colonizing the land, and the other set of people have no rights at all, of any kind. And so, confronting with something like that, feelings well up, and I think it’s entirely natural for anybody of good faith to say “We have to organize and do something about this.”JAY: Right. WATERS: And Sut’s movie, “The Occupation of the American Mind,” is one of the best tools of activism that I’ve seen. And I was extremely pleased to be able to act the narrative for it. Because it very coachingly tells the story of how the American public have been deceived, since 1947, as to the reality on the ground in Israel and in the surrounding countries.JAY: Sut, how long did it take to make this film, and it’s a difficult film to make, because you know it’s going to be hard to show this anywhere in the United States. JHALLY: It took us a while to make actually. We started this over five years ago. We actually had made a previous film, that came out in 2004, called “Peace Propaganda in the Promised Land,” which was about comparing American media coverage with European media coverage. And then, you know, it deals with some similar issues. But then, when the Gaza attacks first happened, it seemed as though something new was happening, and so we started to work on a new film. And, you know, it was the first Gaza attack in 2008, and then we didn’t know, while we were working on the film, that another two attacks would happen at the same time. So that was why we worked on the film.JAY: Yea, I mean, that was an astounding moment. Bombs raining down on Gaza, you know, thousands of injuries and deaths, and Israel’s the victim. JHALLY: And Israel’s the victim, and there is support in, you know, massive public support in the U.S.
JAY: A resolution gets passed in the U.S senate. JAY: Well, we’ve seen this in other polling across the country, that a majority opinion, at least used to, I’m not sure where it is now, used to have the same idea. JHALLY: Yea, so I mean, and that’s why I was interested. How can reality be turned on it’s head. JAY: So, this film is about a public relations exercise. Conscious, planned, and this is…the film introduces the concept here. This framing of how Israel is the victim and Palestinians somehow hate Jews, and this is why they can’t live or abide living next to an Israeli state, a Jewish State, how does this get to be so pervasive, that the majority of American opinion, even when they’re show images of children dying in Gaza, and the attacks on Gaza, and in fact, in the last attack on Gaza, I was kind of struck. It seemed to me, for the first time, almost, the New York Times actually showed pictures of dead children. You actually got some sense of what it had done to people. You could still have senate resolutions calling this an Israeli right to self-defense and such. JHALLY: Yea, I mean, an Israeli spokesperson actually said, “in the war of pictures, we lose.” So you have to explain. You have to frame the pictures. And that’s what Israel has done. It’s a massive propaganda campaign, to flood the airwaves with explanations for why there are these dead children, and why for the blame for the dead children rests in the hands of Hamas and Palestinians, and not Israel. And so, that’s a challenge that Israel recognizes, that these pictures could be very damaging. However, one of the things we know, about public relations is, pictures never tell a story by themselves. You can always give a different interpretation to the pictures. You can always give a different interpretation to the story. In fact, it’s the…Gore Vidal once talked about the lesson of Confucius. That Confucius was once asked what he would do if he were ever to run the state. That his views in charge, what would he do? And Confucius answered by saying he would “rectify the language.” And, what he meant by that was, that was if you can control the stories, if you can control the language, then you can control the categories through which people think about the world. And you don’t need police and military on street corners. You can colonize people in their own imaginations, in their own heads. JAY: And as you point out in the film, one of the most important ingredients in that is repetition, which is kind of why we’re doing The Real News. It’s the daily repetition that makes this thing…shapes peoples world view, when they see these events unfold. JHALLY: Yea, and that’s the way public relations works. It doesn’t work by one message by itself. It works by being this cumulative effect over a long period of time. So even if you have one message that comes the way, it has no impact when the flood of messages is going in the other direction.JAY: Roger, how much were you effected yourself by the sort of official narrative in the media? You had actually booked that concert. Once you got there, and you were able to see with your own eyes and talk to people, you changed the venue, but before you went, how much were you influenced by, you know, the main narrative yourself? WATERS: I’m not sure that it impinged on me greatly. You know, I’ve been kind of, I hate to say it, but I’ve been busy doing my work for most of my life. I’ve worked really hard. I really enjoy my work, so I’m sort of engaged in it. And the story tends to go by somewhere in the background until you’re confronted with it, face to face, in a personal, upfront way. And then you have to respond to it. But further to what you guys were saying, about what happens, never mind the theory, which is all very interesting, and it’s a very nice kind of academic conversation about public relations, the fact is that the system that the Israeli powers that be have…the Hezbollah, the explaining of their situation, is not actually explaining anything. It’s a euphemism, to suggest explaining. They’re telling a big lie, and they are repeating it over, and over, and over again. And they are also persuading some of the lackeys that they have in this country, for instance, Hillary Clinton is a very good example of this, to repeat the lie for them. And they all repeat the same lie over and over again. Sut, in Suts movie, it’s very very well illustrated. In fact, you used it yourself, just now. You talked about bombs raining down on Gaza, ok, well that’s perfectly legitimate description for what happened, not just in protective edge in 2014, but also in Carstead in 2008-2009. Bombs rained down on Gaza. The big lie that they tell, when there’s ever any conflict, or ever any bombing of anyone, is “and the missiles rained down.” And in this movie, you hear people saying it countless times. Hillary said it about ten times in the navy yard in Brooklyn, like two weeks ago, in the debate with Sanders, when Sanders was trying to make the point that there are two sides to this story. That’s all he was doing. But what he was doing there was completely revolutionary, because he’s the first politician that we’ve heard in the United States even suggesting that it might be two sides to this story. So it’s really interesting, the language that they use. It’s been..well Sut knows better than I…it’s been taught to them, by Frank Luntz and others, who’ve said “this is how you effect public opinion, you lie to people. And these are the words that you must choose to tell the lie with.” But our policy is to tell a big lie, and the big lie is this, we are little David and we’re being attacked by Goliath. And Goliath is these awful terrorists, who surround us, and who are constantly attacking us. And we, much as we hate it, have to defend ourselves. And that is why sometimes we need to take to the skies with our drones, and our F-16s, and whatever it is that they use. And that is the big lie that they tell. And so that narrative that which, actually, the real narrative is that exactly the opposite is true. That Israel is not David. Israel is Goliath. And their attacks upon Gaza particularly, because the people there are incarcerated in an open air prison, and are entirely defenseless against attack from the air and the sea. They defend their attacks on Gaza, on the grounds that they are defending themselves. They’re not defending themselves. What they’re doing is, they are what they describe as mowing the grass or mowing the lawn, which is a disgusting euphemism to use about the slaughter of net-neighboring peoples, who happen to be inhabiting land that you covet. This is the real story of whats going on. The story is that the Israeli government…I’m not talking about Jewish people. I’m not talking about the Israeli people, though a lot of them, I have to say, do support the actions of their government. But this very very right wing government, that is in power in Israel at the moment, is determined, and it’s as plain as a pike staff to see, to occupy forever, all the land between the Jordan river and the Mediterranean. WATERS: And between the Lebanese boarder and the [inaud.]. That is their determination. And they’re doing it. And they’re doing it willy-nilly. And they’re pretending not to do it. So part of their big lie is “we want to make peace with our neighbors.” No they don’t. That is just a barefaced lie. But if you say that, then get a spokesperson for the Israeli government will come on, and say the lie again. Exactly the same lie, they’ll say it again. “We want peace. We’re just defending ourselves.” The rockets rain down, and they go on saying the same thing, over, and over, and over again.Now, this might be ok in a country like the United States of America, for the people to make up their minds about what the true narrative is. Except, they’re not being given a chance to look at the narrative, which is why you and I are here today. To help Sut persuade the media to show his movie to the people. So the people of the United States may make up their own minds as to what’s going on. And who is the victim. And who is the perpetrator. Whether the occupying army, the occupying army, the IDF, or the Israeli occupation force, whether that’s Goliath, what the press says, or whether it’s the people who have been woken up in the middle of the night and having their kids dragged off to prison. Whether they’re the oppressors. But the film has to be shown so that people get a chance to see the other side of the narrative.JAY: So, we’re going to continue this discussion in multiple parts, which I hope you’ll come back and watch part two. But before we go, how do people watch this film? JHALLY: We have a website. It’s called www.occupationmovie.com. And you can watch the movie there. You can stream it for five dollars, or we hope people will give more. You can also buy the film as a DVD. So we hope a lot of people will go directly to the site and be able to watch the film immediately after this interview. WATERS: Why isn’t it being played on Netflix? Or why isn’t it on HBO? Why isn’t it in one of the places where it is readily available for large numbers of cable customers to get it, without having to search around the net, and without them having to find this particular website, or without them having to look for it? This is important information for every citizen of the United States to have at their fingertips. It should be in every home. So that people can look at it, and then they get a chance to start forming an opinion about the situation vis-a-vis Israel Palestine. JAY: Well, why it’s not on Netflix or mainstream media, we are going to get into exactly that topic, as we work our way through the interview. So please join us for part 2 of our interview with Sut Jhally and Roger Waters on Reality Asserts Itself, on The Real News Network. Parts 2 &3 at The Real News Network (TRNN).